Her dreams are made of a thousand and one fabrics fashioned out of a thousand and one stitches. This I learned about Cora de Jesus Manimbo. One of the most meaningful events I was fortunate to attend recently was a store blessing of a newfound friend. More than just a dress shop, this blessed establishment represents a miracle borne from adversity, an answered prayer for Cora and her family. It was a joyful gathering of family, friends and loyal patrons who shared in her joys having witnessed firsthand the difficulties that Cora went through. Judging from the attendance, the Manimbo family is well loved by many. I spotted a lovely lady in a cloud of pink (my favorite color) fleeting around, warmly greeting her guests. It was Cora elegantly garbed in her own creation. “Thank you for being here, Michelle and Benny,” she said with a smile. And really what a great address it is. Much more accessible, according to her clients, than the former Marikina location. Her new shop Cora D.J. Manimbo Fashion House is located on the upper ground floor of Swire Elan Suites, a condotel building on 49 Annapolis St., Greenhills in San Juan. Over a sumptuous breakfast buffet in the hotel café, we got to meet the dynamic couple behind Elan Suites. From architect Ramon Licup and his pretty wife Elena Murillo Licup, I learned that their condo hotel is very popular among balikbayans and foreign guests. Conveniently located right across the lively Greenhills shopping complex, it is a solid landmark in Greenhills. No wonder that this location is perfect for Cora’s balikbayan clients. After getting their wedding ensembles made at Cora’s they can stroll down the street in the company of their family and friends, catch up on the latest movies, shop for pasalubongs and then feast on a great variety of cuisine or just restaurant hop. When they are tired, they can simply walk back to the hotel with all their packages and indulge in the hotel spa which is right by Cora’s shop. Cora entered UP for two semesters before transferring to Philippine School of Business Administration as a fulltime scholar and finished Business Administration major in Accounting. She eventually became a Certified Public Accountant. While working in Security Bank & Trust Company as a financial analyst, she helped set up a family business, a small pawnshop operation in Marikina and a one-stop printing shop. After four years of banking and family businesses, she resigned and focused in helping her parents send her siblings to college. After a while, she wanted to improve her skills, she accepted an offer to work in a big printing and packaging company, the “Propack Philippines” where she was trained to be an expert in color matching, combinations, separations and lay-out designing. After a year, her boss found a perfect employee who wanted to learn everything about the business, she was promoted to be assistant to the president after two years, handling all of her boss’ accounts. She was hungry for knowledge in everything she did. She excelled in organizing events and trade shows for the company; attending seminars and attending to suppliers and principals. In short, Cora was a superwoman. In 1986, at the height of the Edsa Revolution, Cora met a gentleman named Bernardito “Bernie” Manimbo, fell in love and they married in 1989. Because her schedule was flexible, she was able to attend to her growing up children while manning the business, too. “One good thing about our business is that it was the foreigners who enjoyed our products and began to promote the unique Philippine-made textile and designs that are mind-blowing in terms of quality. 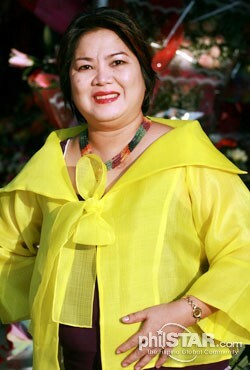 We began to scour for suppliers of materials and we also began to teach weavers on what to pursue in terms of color, design, quality, and to advocate the promotion of these Philippine artworks especially to other nationalities,” Cora said, adding that the happiest moments in her life were the times she gave birth to her three children. Cora said she has always dreamed of a better life for their children and that they anchor their everyday endeavours on hard work, love and faith in God.